The Rest Of The Story: We've been on the lookout for some of the wine that Campbell Mattison wrote about in Why The French Hate Us. Our first forray into the thicket of less commercialized Australian wine led us right into a thorn bush. The Richard Hamilton Riesling from McLaren Vale was so obviously flawed by brettanomyces that we winced at having just paid $18 for rot gut. If California is your reference point, take everything you know and expect out of Chardonnay and chuck it out the nearest window. First off, it's a 5 year old Chardonnay (more on that in a minute), so it's got some age on it. But from the first sip you know this is going to be different - luxurious. The color of a rich Bordeaux Blanc, the strong body is structured - not fleshy - but layered the way fine white Burgundies can be. Summing up this wine by comparing it to others is unfair as its character is its own - disctinctive and unique and, well, interesting. And really good. Not a shy wine, but its moderate alcohol (13%) is a welcome surprise. Oak is present, though subtle and nicely integrated. It's got a slight spicy bite (probably from age) on the start while being clean and powerful at the same time. Somehow this wine strikes a balance between grace and strength - more of a wide receiver than a quarterback. If this is representative of Chardonnays from this area, then run (don't walk) to a retailer - or, more likely, etailer - and start experimenting. We reached out to the folks at Wildberry to ask about the age, but they are all out surfing on the tasty waves off Margaret River. 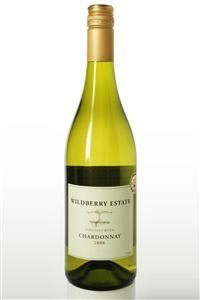 Turns out their current release is a 2006, so they like to age their Chard a little before release...enjoy. In response to this review, Melissa Horley, head of Sales and Marketing at Flying Fish Cove (which owns the Wildberry label), said "Our aim with this particular wine is to release it as early as possible in order for it to be fresh and crisp, as it is an un-oaked Chardonnay. It is quite unusual for you to come across this wine as firstly we only release our Wildberry Estate range to the USA, and secondly we have released a couple of other vintages since the 2005. Our Wildberry Estate range has since been replaced with the 2 Passions label...and the last shipment we sent to America was our 2008 Chardonnay."